The link is clear, so what can be done? This explainer was written by a group of UBC graduate students as part of our Lind Initiative series on inequality. It was an assignment from a course on public policy. The potential for droughts, floods, migration and conflict resulting from climate change are well-publicized. Certain regions and groups are more exposed to these risks than others, and yet the ways climate change exacerbates inequality has been largely overlooked. Not only are the poor less equipped to deal with the impacts of climate change, but exposure and lack of capacity to cope with the effects associated with climate change — from sea level rise to flooding to crop failures — makes them even more vulnerable. While Meera Subramanian explored the role of inequality in environmental issues for OpenCanada, and a lecture by Green Party leader Elizabeth May provided a Canadian perspective, here are seven ways climate change is connected to inequality. Taken together, they make fighting the problem a lot more difficult. The negative impacts of climate change are rarely accounted for in business quarterly reports, thus increasing corporate profit at the expense of social and ecosystem stability. Investigative reporting has revealed that many companies, like ExxonMobil, have prepared their own corporations internally for the impacts of climate change, while simultaneously advocating against national and international climate change mitigation measures, effectively muddying the science and journalism around these issues. There is also the issue of international trade, which, like the recent Trans-Pacific Partnership, could be acting as a sword to address pollution but is instead acting as shield for dirty industries. Trade agreements can have strong environmental sections to address climate change. However, currently they are weak, and allow corporations to allege environmental protection legislation hinders free trade. As a result, developing nations effectively subsidize developed nations by allowing pollution, causing industry to be exported while making it more difficult to protect their own citizens. Internationally, the problem of global wealth inequality further complicates the problem of climate change – a problem for which not all countries in the world are equally responsible. A Canadian citizen, for example, puts on average as much carbon dioxide into the atmosphere as four Chinese citizens or 16 Indian citizens. A recent report showed that the richest 10 percent of the world’s population are responsible for 50 percent of global carbon emissions, while the poorest 50 percent – 3.5 billion people – are responsible for 10 percent of the emissions (see this great interview with the author of the report). The general pattern we see is that the biggest polluters in the world tend to be the richest countries, but countries that are the most affected are usually developing. Bangladesh faces extreme sea level rises, and, by a simple 2oC change in global temperatures, hurricanes will devastate the Caribbean, and large areas of the African continent will experience extreme drought. Vast portions of the Middle East will become intolerable to humans by 2100, and the Fertile Crescent – the cradle of civilization – will also disappear by the end of the century. These situations will be compounded by a lack of proper infrastructure and the strong institutional governance necessary for mitigating the damages. As such, at the heart of this global issue lies a problematic paradox: the biggest polluters will not be the most affected by the consequences of their pollution. It is convenient for these rich polluters to self-deceive and forget about the consequences of their actions – or in some cases, propose peculiar solutions. For example, rich countries usually make the claim that the developing world should limit its use of fossil fuels without proposing any other alternatives that might help these countries with economic growth (see for example, this interview with Nicaragua’s chief climate negotiator at the 2015 Paris Climate Summit). However, because many of these developing countries are poor, their top priority is industrialization. Following examples set by rich countries, their plans for industrialization very much depend on fossil fuels, relegating plans to reduce greenhouse gas emissions to the bottom of the priority list. As such, what the developed world expects of developing nations doesn’t come across as feasible or fair. Whereas refugees were, in the past, often borne from war, political instability and localized disasters, we have now entered the era of the climate refugee – people forced to flee homes rendered inhospitable by the effects of global climate change. It has been suggested that climate change will displace 250 million people by 2050. Coastal regions are threatened by rising sea levels. Developing coastal regions are even more disproportionately affected, often lacking the resources to adapt to and mitigate climate impacts. Small island developing states are a special case, with entire nations at risk of losing their land as a consequence of sea level rise. The Marshall Islands are a perfect example, as mass migration from this country has already started. The Maldives is another extreme example, as it is a low-lying country built on coral reefs (see this video on the struggles of the ousted Maldivian president for climate justice). Droughts will lead to loss of arable land. Many who depend on these lands for agriculture will have to leave their lands behind and migrate. Between 2007 and 2010, Syria experienced its worst drought in recorded history, which led to agriculture failures and the mass migration of 1.5 million people from rural areas to urban areas. A recent study has linked these events to human-induced global warming and to political unrest in the country, the consequences of which we see everyday on every news station. Climate change wreaks havoc on agricultural systems when crop failures associated with drought and floods become more frequent. 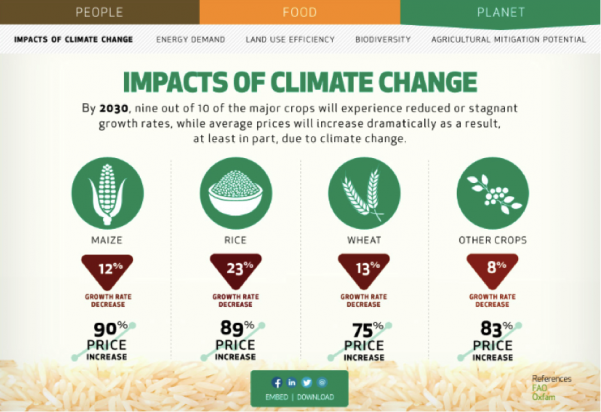 Food security can be quantified in several ways, including the availability of food, access to food and the stability of food systems – all of which are affected by climate change. Not only are poor populations less likely to have irrigation systems, but they are also more likely to rely on rain and subsistence farming for their own nutritional needs. With respect to access, the poor spend a higher proportion of their income on food than the rich, and are thus more vulnerable to price spikes associated with scarcity when yields are lower due to climate impacts. In 2008, such increases in food prices resulted in 100 million people falling into poverty, while reduced yields for several staple crops are projected to trigger similar events in the future. Regionally, those most at risk are people who live on coasts and floodplains, in dry regions and in the Arctic, with climate impact on agriculture estimated to have the most negative effects in less developed regions who are already vulnerable. Food systems themselves become more vulnerable when internal and international migration puts more pressure on certain regions. Simultaneously, diseases and pests spread more easily in warmer temperatures, which can influence crops and livestock, as well as people. Nutritional deficiencies reduce our capacity to fight off disease, while illnesses that are already more likely to affect children and the poor, like malaria and diarrhea, can more easily spread. Health impacts driven by climate change can further exacerbate vulnerabilities, resulting in a significant amplification of climate effects on people and populations. 5. Inequality within states factors into the impacts of climate change. Disadvantaged minority groups within nations are disproportionately at risk in the face of climate change. The idea of ‘environmental racism’ entered the public discourse in the United Church of Christ’s Commission for Racial Justice 1987 report, ‘Toxic wastes and race in the United States’. The term illuminates yet another form of inequality in the face of environmental destruction: environmental hazards disproportionately affect ethnic minority groups. Intentional decisions to place toxic waste sites and other pollution facilities in minority neighbourhoods has long been seen as the chief cause of this, but the concentration of non-whites in relatively polluted inner-city industrial areas has, importantly, been a more structural outcome of decades of housing market discrimination and ‘white flight’ to the suburbs. Although race or ethnicity are not the only drivers of this process, with low incomes in general also locking people into places that are more exposed to environmental hazards, it is clear that ‘white privilege’ increasingly includes living in healthier environments. With a changing climate this inequality is likely to become more severe, as we’ve already seen with Hurricane Katrina’s devastating effects on the predominantly African-American parts of New Orleans. In the discussion of climate change and inequality, global indigenous peoples require particular attention. Because of indigenous peoples’ intimate relationship with the land, they are often the first ones affected by climate change. Their harmonious existence with and dependence on the land also causes them to suffer the consequences of climate change to a far greater degree than others. The two indigenous regions impacted most severely are the Arctic and the Pacific, where small countries like Tuvalu are under threat of going underwater, while in the north, immediate challenges include food insecurity and endangerment of traditional ways of life. Industrial development and extractive industries have caused indigenous peoples to suffer a loss of control over lands and water, and the effects include: deforestation, forest fragmentation, forest fires, hurricanes, spread of disease, droughts, flooding, changes and disappearance of species and lesser availability of traditional food sources. Climate change exacerbates the difficulties already faced by vulnerable indigenous communities, including political and economic marginalization, loss of land and resources, human rights violations, discrimination and unemployment. Another important differentiating factor here is that indigenous peoples often do not share the national economic and social developmental benefits derived from environmental degradation, nor are they properly consulted in decision-making processes. Social discrimination, cultural barriers and the exclusion of indigenous peoples from national political processes make them vulnerable and subject to further exploitation. Industrial forces and economic development have not only disrupted indigenous peoples’ traditional lifestyles, but have also threatened their very existence. Intergenerational inequality is the failure to recognize that every human – present and future – has the right to share natural resources and enjoy a healthy, functioning ecosystem. A majority of the world’s countries and companies desire immediate gain and ignore long-term impacts. For them, a dollar today is preferred to preserving resources for tomorrow. This makes sense when you think about it, because as humans, we tend to seek immediate gratification and favour it over long-term gain. It’s how we’re psychologically wired; the reason behind why we say we’ll go to the gym tomorrow or wash the dishes later. There are two problems at the core of intergenerational inequality. First, future generations will not have access to a reasonable amount of finite resources like water, forests, fertile soil or even fossil fuels, for example. Second, broader ecological destruction caused by climate change will create a world with significantly reduced animal and plant diversity, as well as fewer safely inhabitable areas than we have today. Combating climate change and inequality requires commitment across communities and nations. International cooperation, domestic reforms and grassroots pressure is required if we are to achieve progress for both inequality and climate action. There is a multiplier effect in doing so: investment in activities that alleviate climate change can also support economic growth, altering our energy trajectory towards cleaner production and new technologies, and improving quality of life in developing countries. Though our window of opportunity to act in ways that will prevent catastrophic warming (considered to be a rise of more than 2 degrees Celsius) is closing, we are optimistic that with the sense of urgency and multiple benefits associated with these actions there is real potential for change. Here are some of the most promising actions that can tackle both climate change and an increasingly unequal world. Global Climate Fund: A global fund for climate adaptation. Contributions from largest emitters for capacity building and infrastructure investments would support the most vulnerable nations and peoples. This was agreed upon at the Copenhagen Accord, but lacked a mechanism to determine how it would be financed. Global Carbon Tax + Global Wealth Tax: A global carbon tax, combined with a global wealth tax, is one policy whose proceeds could contribute to the above Global Climate Fund. In effect, carbon taxes disincentivize the use of fossil fuels by making them more expensive to use, while a global wealth tax would directly lower extreme instances of wealth inequality. Alberta and BC, for example, both have carbon taxes, the proceeds of which are funnelled toward climate mitigation activities within Canada. Debt Relief: Debt relief to developing nations, with the caveat that funds previously allocated to finance debt go instead toward investing in infrastructure and other adaption efforts; this has been pioneered in the South Pacific with the Nature Conservancy and a number of EU governments’ support. Global Treaty for Reducing Greenhouse Gas Emissions: An enforceable global treaty that commits all nations to keep carbon dioxide concentration in the atmosphere below 2oC, with the largest emitters (countries and industries) acting aggressively to enable technology transfer and reduce the economic burden to developing countries. Globally-Enforceable Economic Regulations: If a treaty is not agreed upon internationally, then trade regulations can be harnessed to encourage reductions in greenhouse gas emissions. Threatening to limit trade with nations who are uncooperative in taking action to address climate change – through tariffs, for example – will give them a more immediate incentive to cooperate. This is an inherently punitive measure, but there are also regulations that can be implemented to reward good national policies. Reducing tariffs on beneficial technologies, for example, would not only increase green technology in developed nations but would pave a path to climate adaptation in less developed countries too, by allowing them to borrow clean technology ideas and reduce their reliance on petroleum products and fossil fuels. Rapid Growth of Renewable Energy: The renewable energy sector is growing faster than ever anticipated; global solar capacity is doubling every year. This means more than half of the planet’s increasing energy needs could be provided by solar by 2030. Investing in renewable energy has a knock-on effect. It produces the possibility for technology transfer to poorer regions and less developed countries, while associated ‘climate jobs’ have the potential to address climate and economic concerns by countering the labour market’s ‘hollowing out’ of the middle by providing skilled industrial employment in green manufacturing. The call for climate jobs has been taken up by trade unions from Britain to South Africa. This shows that policies able to step up to this challenge can expect strong grassroots support. Environment as a Human Right - For Now and Future Generations: Some jurisdictions are taking steps in order to provide improved protections by considering the environment as a human right. These regulations must be considered when new laws are implemented regarding environmental protections, and such language is already in the constitutions of 95 countries. In Canada, a campaign to do so has been signed by 98 municipalities across the country. There are also calls to extend this type of legal intervention to future generations and provide avenues by which these rights could be protected by courts. Recognizing the Critical Role of Indigenous Peoples: We know today that the traditional knowledge of indigenous peoples relating to the earth and resource management is critical. Prime Minister Justin Trudeau echoed these sentiments, claiming: “indigenous peoples have known for thousands of years how to care for our planet. The rest of us have a lot to learn.” By endorsing the United Nations Declaration on the Rights of Indigenous People, Canada can not only recognize these rights but also take stronger action to ensure Canada’s indigenous peoples are given a decisive voice in formulating policies about sustainable resource development. Developing Plans for Climate Refugees: There is a need to recognize the increasing role of climate in human migration and, in the most at-risk regions, develop plans for accommodating more people within regions of less risk within the same country (and, if necessary, elsewhere). Plans like Vancouver’s Welcome House Centre are one way of helping mitigate the hardships that climate refugees face. Recently, Bill McKibben, the founder of 350.org, said in an interview that the agreements in Paris will probably lead to about 3.5oC warming of the global temperature, the effects of which will be catastrophic. The former Bolivian climate negotiator, Pablo Solón, also mentioned that the “the Paris Agreement will see the planet burn.” The well-known climate scientist from Columbia University, James Hansen, who recently wrote a report saying that a 2oC change in global temperature will “[threaten] the fabric of civilization,” called the Paris summit “a total fraud.” So while the Paris agreement is a step in the right direction, we’re not even close to being out of the woods. But there is reason to be hopeful. More than half a million people from all around the globe took to the streets to protest against climate injustice before the Paris conference. The Divestment Movement is growing exponentially, in universities, municipalities, parliaments and beyond. The Keystone Pipeline project and Shell’s Arctic drilling project were cancelled due to pressure from the people (see this great video made by 350.org). It is only through the recognition that we are in this together that policies halting the adverse effects of climate change can be implemented. This explainer was written by a group of UBC graduate students as part of our Lind Initiative series on inequality. The inaugural 2015 UBC Lind Initiative, hosted by the Liu Institute for Global Issues, examines the far-reaching effects of inequality. A speaker series led by economist Joseph Stiglitz and featuring Jill Abramson, Teju Cole, Jeffrey Sachs and Elizabeth May was held in the Fall Term of 2015, while a series of essays, analysis and feature stories ran concurrently on OpenCanada.org. Here are the pros and cons of the mechanism within the Trans-Pacific Partnership for solving disputes between investors and foreign governments. Can policy change lead to more equitable access to life-saving medicines? Inequality Explained: Will the Trans-Pacific Partnership affect Canada’s food sovereignty? Nine questions on the TPP’s potential impact Canadians should be asking. When tension grows between people and profit, communities must learn how to extract, manage and share resources in a just way.